Winter melons are perhaps the largest cold season melons. They can measure 15 inches in diameter and can weigh in excess of thirty pounds at maturity. They are most often marketed by the slice due to their extreme size. Winter melons first impression is a hard, thin, chalky pistachio colored skin with a waxy feel. Its snow white flesh is mild flavored with a similar water rich texture of a watermelon. It bears a large seed cavity that takes up a considerable amount of the flesh. 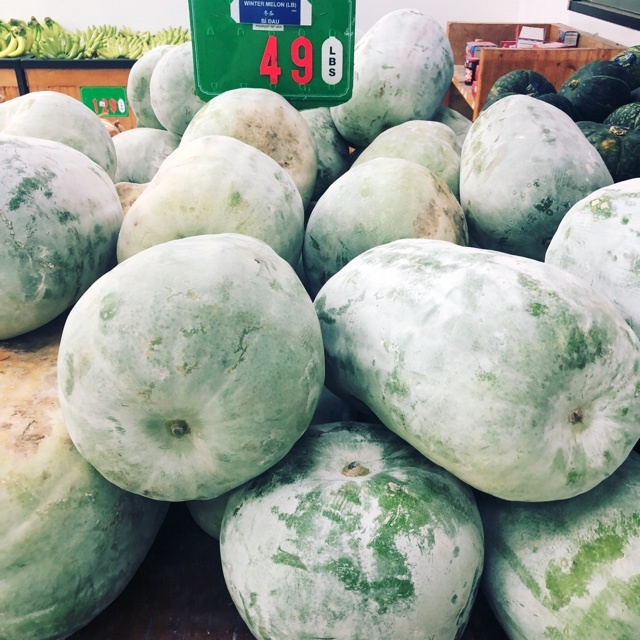 Just as the name suggests, Winter melons are available during the winter season. 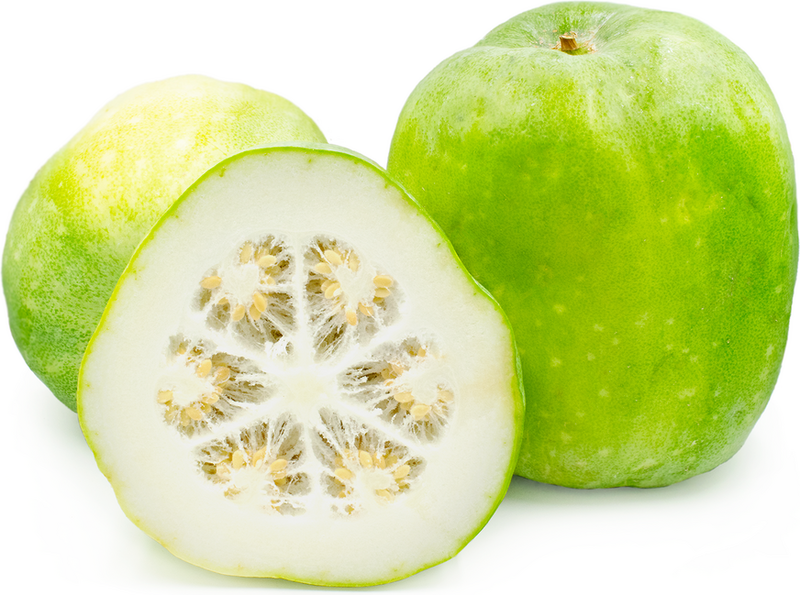 Known by several names, Winter melon is called Tung Gwa, Dong Gua and Doan Gwa in China; Sufed Kaddu, Petha and Lauki in India; Togan in Japan; Fak in Thailand; Wax gourd; White gourd; and Winter gourd. It is the fruit of the Asian vine Benincasa hispida and is used most extensively in Chinese cuisine. Cubed or sliced, Winter melon can be steamed, simmered, braised or parboiled and added to stir-fries. Best used in soups, season this rather mild and bland melon with strong spices and herbs. 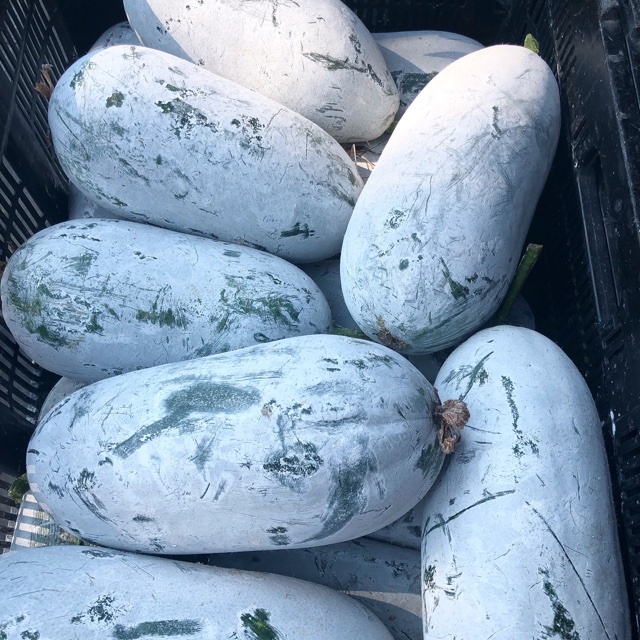 Winter melon are suitable for pickling and may be diced and candied. Whole Winter melons will keep in a cool place for months. Winter melon is most acclaimed as the ingredient in the Chinese soup known as tung qwa chung or dong gwa jong, or Winter Melon Pond. This famous soup consists of a rich chicken broth that is cooked and served in the skin of the Winter melon. The skin of the Winter melon is elaborately carved with motifs such as the mythical dragon and phoenix. Winter melons grow best in warm weather with maximum sunshine. The Winter melon is an ancient food staple of China and was first cultivated in ancient Egypt. Introduced into Europe during the Renaissance, today this melon is cultivated throughout the world. It is grown in Europe, Asia, the Americas and Australia. Recipes that include Winter Melon. One is easiest, three is harder. 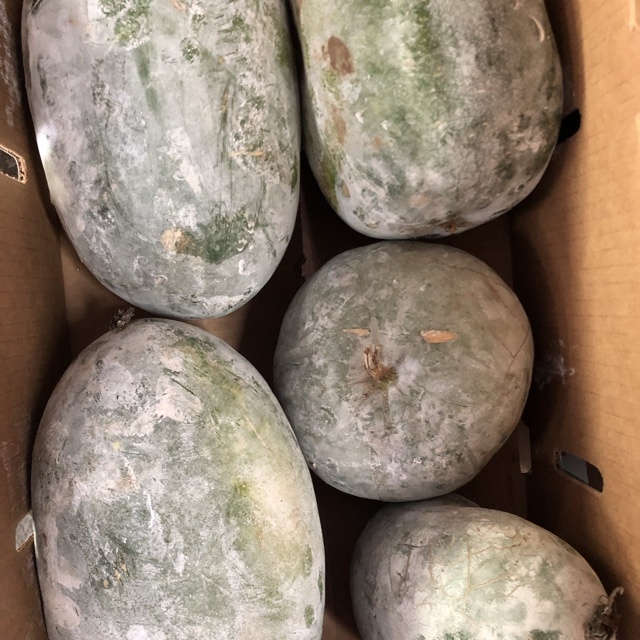 People have shared Winter Melon using the Specialty Produce app for iPhone and Android. Sharer's comments : Winter Melon spotted at Thuan Phat Supermarket. 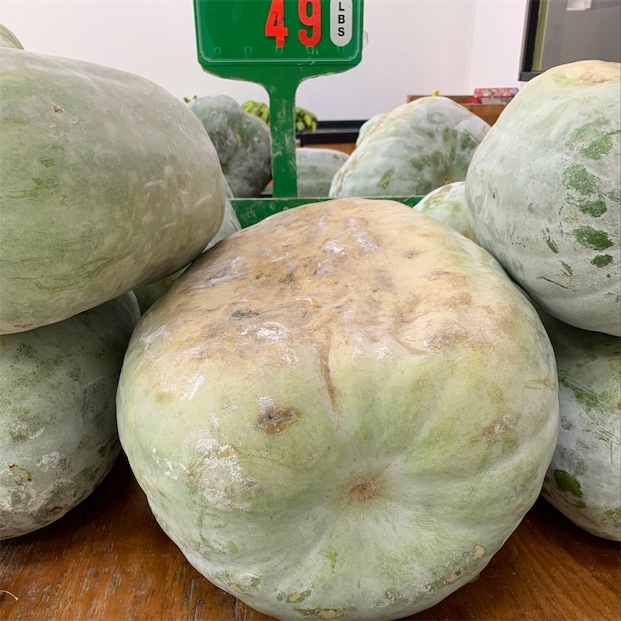 Sharer's comments : Winter Melon spotted at Leks produce Market at the Oldsmar Florida Flea Market. 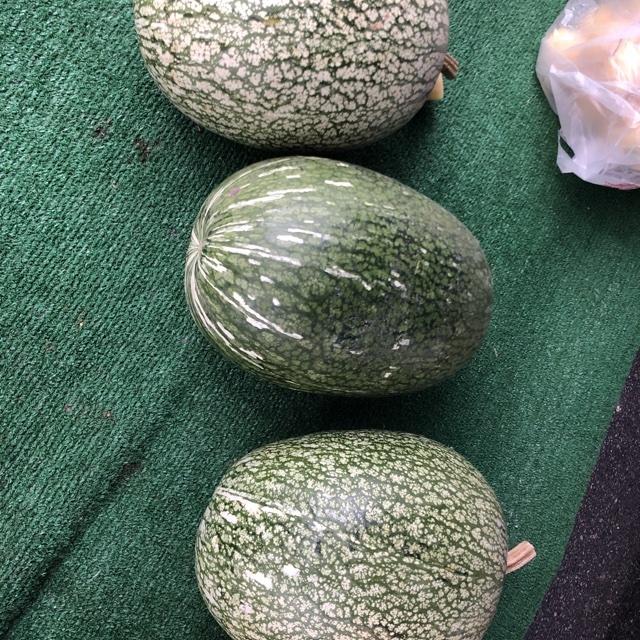 Sharer's comments : Winter Melon spotted at Mariner's Farmers Market. Sharer's comments : Winter Melon spotted at Asian Food Center.